NUTRIVO R1 Whey Blend is a protein supplement based on the mix of concentrate, isolate and hydrolysate of whey protein. Applying various protein fractions in the supplement entails a positive effect in the form of prolonging the time of absorption of the whole product. Amino acids start to be assimilated according to the beginning of the absorption of the fastest released fraction, i.e. hydrolysate and end when the whole protein with the longest assimilation time is absorbed – whey protein concentrate. Thanks to the prolonged assimilation time, we achieve a more stable amino acid inflow to muscle cells and a more beneficial anabolic environment, resulting from better nutrition. In comparison to the most popular supplements based only on the concentrate, we achieve a lower content of fat and sugar, which should positively influence body composition and macronutrient balance in a diet. People who actively practice sport should provide considerably higher amounts of protein with food in comparison to people who are not very active. Increased needs stem from constant damages of muscle fibers during training, which need proper amounts of amino acids to regenerate. Proper protein supply in a diet of an active person contributes to the growth of muscle mass, provided that a positive caloric balance is maintained. Protein amino acids are used not only to regenerate but also to overbuild the damaged muscle fibers, which is crucial to achieve progress in muscle strength and volume. Apart from building muscles, amino acids are also used to create other, incredibly vital structures, which are enzymes and peptide hormones. It means that protein also influences maintaining proper biochemistry of the organism and health. Bodybuilding diet is still perceived as constant eating of chicken with rice, broccoli and olive oil. And despite the fact that dietary awareness has been increased and sportsmen use a wider range of products, many people may still miss a variation in the form of sweet tastes. Here comes with help a protein supplement that may delight out taste buds with its taste intensity and smooth, creamy texture. It may work well especially for gourmands, who cannot live without sweet products in their menus. Active lifestyle limits the time that may be spent in the kitchen preparing meals. It often happens that because of the excess of duties we are forced to eat something quickly or even skip a meal, which should not happen if we are determined to achieve a goal related to our silhouette. Preparing a portion of a protein supplement takes literally a moment, which allows us to save a considerable amount of time and partially replace a planned meal in crisis situations. Taking a portion of a supplement immediately after training is an incredibly popular practice, not without a reason. Fast absorbability of amino acids from a liquid source allows to complement the losses which have occurred during exercises and provides a building block to the development of musculature. However, it is not the only benefit from using the liquid form. After training, a considerable amount of blood is directed to the muscle parts that we have exercised in order to provide them with more energy. Since we have limited blood supplies, in this time our digestive system is less supplied with blood thank usual. Such a state may negatively affect the quality of food digestion. A meal in a liquid form, which is a protein shake is digested much easier, as it doesn’t need to be granulated and may be effectively assimilated even when applied after training. Whey proteins, as proteins of animal origin are characterized by an incredibly beneficial amino acid profile, especially when it comes to BCAA and glutamines, which are especially liked by bodybuilders. 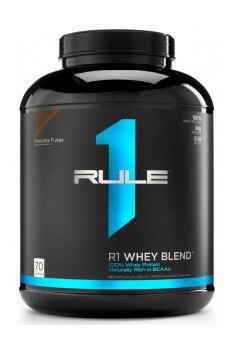 In the supplement Rule One Whey Blend only high-quality materials were used, without the additives of vegetable proteins, which is unfortunately a common practice among the producers of lower quality supplements. Vegetable proteins contain a less favorable amino acid composition for the development of musculature, mainly due to the lower contribution of leucine, demonstrating the most anabolic effect. R1 Whey Blend is recommended to sportsmen who want to increase the participation of protein in their diet in an easy way, providing themselves at the same time with a springboard from traditional dishes for bodybuilders. It may be also helpful for very busy people, because of the short time of preparation. Mix one scoop (33 g) in approx. 250 ml of water or milk. The best reason for using the protein blend is supplementing the amount of protein lacking in our daily balance of macroelements. As for the time of usage, the most well-known and valued way is taking a portion of the supplement immediately after training. Drinking a protein shake before a meal may bring additional benefits in the form of improving insulin sensitivity and possible appetite reduction if this is our aim. Protein supplement is also a way to diversify the taste of sweet dishes, such as pancakes, omelets or even protein ice cream. Nutrivo is a company established in 2013, thanks to experiences of Mike and Tony Costello - the founders of Optimum Nutrition Inc., the aim of whom was to increase the quality of productssold on the supplementation market. The brand also offers products of another incorporated company - Rivalus, which contains in its offer the highest-quality supplements addressed to professional fitness sportsmen as well as Olympians, who enrich their diet with the products of this brand. We will find in the offer standard protein supplements, carbohydrate-protein supplements, allowing to increase muscle mass as well as strong pre-workout stimulants or products which help to burn fatty tissue, the activity of which was proven by the satisfaction of many sportsmen. Tasty bar containing 20g of whey protein and micellar casein. It does not contain gluten, soy and eggs.